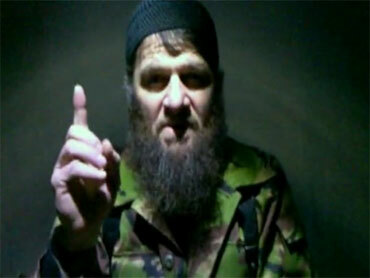 MOSCOW - A website affiliated with Chechen rebels has released a video in which insurgent leader Doku Umarov claims responsibility for last month's deadly suicide bombing at Russia's largest airport and threatens more bloodshed if Russia does not leave the region. The Kavkaz Center website says it received the video late Monday. It was not clear when or where the video was recorded. The Jan. 24 attack at Moscow's Domodedovo Airport killed 36 people. Russian investigators say the bomber was a 20-year-old man from the Caucasus region that includes Chechnya, but have not released his name or other details. "You see this special operation carried out by my order ... more special operations will be carried out in the future," Umarov says in the video, wearing a camouflage uniform and a skullcap. "Among us there are hundreds of brothers who are prepared to sacrifice themselves" in further attacks, Umarov says in the video. "We can at any time carry out operations where we want." Over the weekend, the website released another video in which Umarov also threatened more attacks, saying 2011 would be "the year of blood and tears." Chechen rebels have fought two full-scale wars against Russian forces since 1994. Major offensives in the second war died down about a decade ago, but the insurgency has continued with small clashes in Chechnya and in neighboring Caucasus republics. The rebels have claimed responsibility for an array of terrorist attacks, including last year's double suicide bombing of the Moscow subway system that killed 40 people. Umarov, who seeks to create a Caucasus emirate independent from Russia and governed by Sharia law, said in the earlier video that he could call on 50 to 60 suicide bombers if necessary. The blast at Domodedovo, south of the Russian capital, raised strong concerns about Russia's strategy against the insurgents and about its ability to protect against future attacks. The day after the bombing, President Dmitry Medvedev said that terrorist attacks in the country increased in 2010, although he did not cite figures. The bomb went off in the waiting hall of the international arrivals area at the airport. As in many other airports, there were no security procedures to go through in order to get into that area. Medvedev initially lashed out at airport management for poorly guarding the area, but the airport's operator responded that the Russian transport police are responsible for security in that part of the airport. In the next few days, Medvedev fired several top transport police officials and ordered heightened security measures at all the country's main transport hubs, including major railway stations. The attack took place as Medvedev was preparing to speak at the prestigious World Economic Forum in Davos, Switzerland, where he hoped to reassure foreign investors that Russia was safe and attractive. The bombing forced him to make an abbreviated trip to Davos, where he declared that the attack would not crush Russia or its drive for investment.